Our condo at the beautiful and modern Las Brisas resort delivers the perfect blend of home and vacation that you've been looking for. 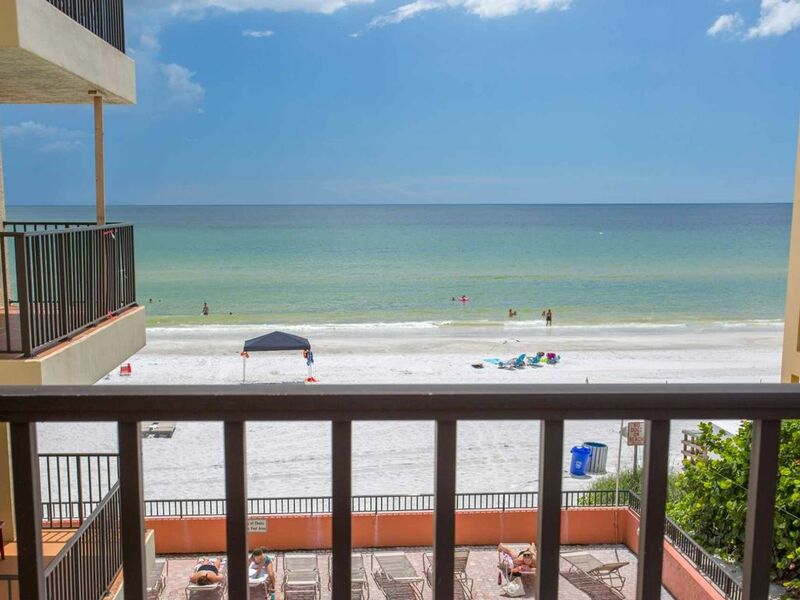 This is a corner unit on the second floor with privacy and space to enjoy your Florida beach vacation. The corner units at the building spans the width of the building, so this condo gives extra space for your family to spread out. Enjoy a fantastic view of the beach and Gulf from your spacious private balcony, with plenty of room for dining or just relaxing. Everything is provided, from a fully stocked kitchen, to clean and comfortable beach and bath towels, linens, to beach chairs and toys. The master bedroom features a comfortable King size bed, walk-in closet, and leads into the attached bathroom. The second bedroom features two full size beds, also with attached full bathroom. The large living room area offers plenty of seating space, and leads out into the beachfront balcony. Free WiFi internet service, TV's in each bedroom, DVD with Blu-ray, and a selection of movies make it a great spot for taking a break from the beach. Swim in the the year-round beachfront heated pool, and enjoy a BBQ at the provided grill and picnic area with Tiki huts. Also included, a reserved parking space. Laundry facilities are not available in the condo or in building, but located just across Gulf Blvd. Condo is right on the beach, great view, and very spacious. We had an awesome time with our family. The condo was very nice and accommodated four adults and two young kids quite nicely. The heated pool was a hit with the kids. Our balcony overlooking the Gulf was beautiful as well as the sunsets. Nice restaurants within walking distance. Only downside was a noisy malfunctioning toilet which was annoying while trying to sleep. Would stay here again if I knew the toilet was fixed. Great location. We had an excellent experience with iTrip and Las Brisas. Unit was great! Perfect for 2 couples. The kitchen was large and well stocked. The beach was beautiful. The pool was heated and nice, but could have used cleaning. Called ITrip support for help with Wi-fi and parking our camper. They responded quickly and were able to resolve/answer all our questions. Enjoyed our stay immensely! Would definitely go back. Unfortunately, there were several problems with unit #208. The condo sleeps 6, so you would assume there would be 6 beach chairs and enough seating for 6 on the balcony. There were 3 beach chairs, 1 was broken, the others in sad shape, not usable. There were 2 chairs on the balcony, 1 was broken. Both toilets has some minor issues that were repaired, but it required 2 phone calls to repair them properly. The beds were very comfortable and plenty of towels, linens and kitchen items. The sofa in the living room was most uncomfortable and broken down. Would not stay in this unit in the future. That's for letting us know! Everything has been looked at and taken care of as best as possible. We are available 24hrs if needed for any issues like this and will respond immediately. Thank you! We had an amazing vacation! Wish it would have been longer, but as a frequent flyer to the area this was hands down THE best place we have ever stayed! Already thinking about booking our next vacation here if the dates are open :) Texted a couple of times to the owners with questions and the response time was excellent!! Thank you for making our much needed getaway excellent! I couldn't say enough about our excellent experience at Las Brias. The location and the beach were great. Our condo was spacious and well furnished. If we go back next year I would want the same condo in the same location. We all loved our time there.